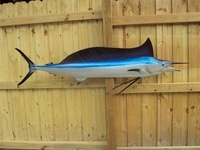 An unusual specimen, this shortbill spearfish makes a great addition to your collection. You normally do not see one of these for sale, but we have a great mold and wanted to share this unique replica. Measuring 70 inches long by 24 inches high. Check it out. Each replicas overall length is determined by measuring from the tip of the mouth (or bill) and running along the lateral line to the fork in the tail and then running the distance from the fork to the end of the longest tail length. All length measurements have the possibility of being off by a small percentage since we are fabricating in fiberglass using a grinding technique. Can take 2-3 weeks to ship.